During this COCA Call, clinicians learned how to apply principles of motivational interviewing and a six-step process that is patient-centered and supports clinical judgment when conflict arises. Presenters reviewed two case studies in which they applied communication strategies, and provided examples of patient-provider dialogue. A new study by CDC is the first to show Zika virus RNA replicating in brain tissues of infants with microcephaly who later died and in placentas of women who suffered pregnancy losses after Zika infection during pregnancy. CDC scientists found Zika virus RNA persisted in fetal brains and in placentas for more than seven months after the pregnant women contracted Zika. The researchers also found evidence of the virus replicating in an infant with microcephaly who died two months after birth. The RNA levels were about 1,000 times higher in the infants’ brains than in the women’s placentas. 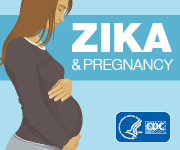 Based on preliminary data from the U.S. Zika Pregnancy Registry, among 442 completed pregnancies, 6% resulted in a fetus or infant with evidence of a Zika virus–related birth defect, primarily microcephaly with brain abnormalities, whereas among women with possible Zika virus infection during the first trimester, 11% had a fetus or infant with a birth defect. This report provides preliminary national birth defects surveillance data on congenital microcephaly following a large outbreak of Zika virus infection in Colombia. Microcephaly prevalence increased more than fourfold overall in 2016 compared to 2015, with a ninefold increase in July 2016 (the peak month) compared to July 2015. The temporal association between Zika virus infections and microcephaly, with the peak of reported microcephaly occurring approximately 24 weeks after the peak of the Zika outbreak, provides evidence that the greatest risk period is likely during the first trimester of pregnancy and early in the second trimester of pregnancy. The health threats of 2016 came in all sizes, ranging from drug-resistant superbugs to Zika-carrying mosquitoes to a powerful hurricane. In a digital press kit released December 14, CDC highlighted key agency activities during 2016 and previews what could come in 2017. In its 70th year, CDC continues to protect the health of all Americans, whether threats came from infectious or chronic diseases, environmental dangers, occupational hazards, or injuries. The catheters have a potential for excess material to remain at the tip of the catheter from the manufacturing process. If this occurs, the excess material may separate from the catheter during use and could enter the patient’s bloodstream. This can result in serious adverse health consequences such as the development of blood clots, embolism of the excess material to vital organs, or death.